The New England Patriots considered trading up to the second pick to draft Baker Mayfield if he didn't go No. 1. Mayfield's agent said on a podcast that they were told that the Patriots would consider moving up to the second pick. According to a report, once the Patriots acquired the 23rd pick in the draft, they had four picks in the first two rounds, enough capital to trade up and look for a backup to Tom Brady. Baker Mayfield was taken with the first overall pick in the NFL draft by the Cleveland Browns but had he slipped, a surprising team might have been waiting to pounce. Mayfield's agent, Jack Mills, told Sports Illustrated's Andrew Brandt that the New England Patriots were flirting with the idea of making a big trade up to draft Mayfield. Mills told Brandt that teams came away enamored with Mayfield after interviewing him and working him out, and they felt he would be one of the top picks. If he wasn't No. 1, however, the Patriots might have made a leap for him. "Another team had said, 'You may get a big surprise on draft day at No. 2 if he's available,'" Mills said. "And it was the Patriots." 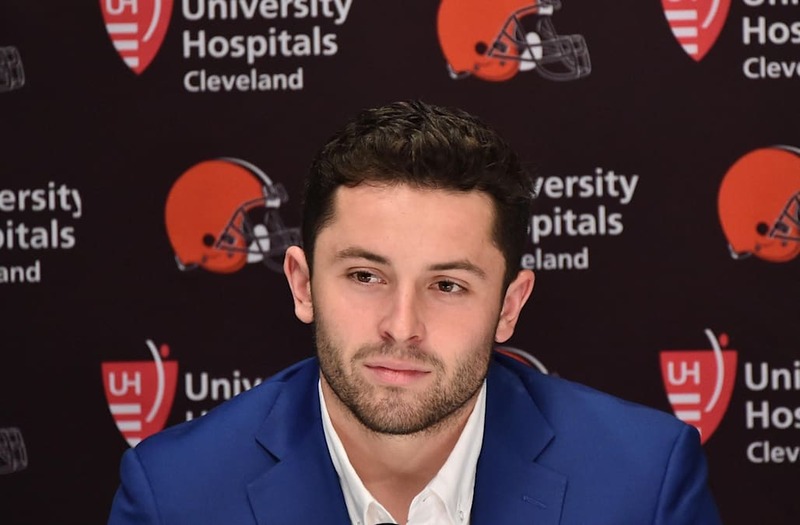 Sports Illustrated's Albert Breer reported shortly after that, when the Patriots first contacted Mayfield's camp to set up a pre-draft meeting, they were turned down. At that point, the Patriots only had their 31st pick and two second-round picks — it was unlikely that had the assets to leap to where Mayfield might get drafted. But after trading Brandin Cooks to the Los Angeles Rams for the 23rd pick, the Patriots then owned two first- and two second-round picks — enough capital to potentially swing a big trade for the second overall pick. The second pick would make sense, too, as the Giants were reportedly something of a wild card going into the draft, with the potential to stay put or trade down. Ultimately, Mayfield went No. 1 to the Browns, and the Patriots didn't make any bold moves, taking OT Isaiah Wynn with the 23rd pick and running back Sony Michel with the 31st pick. The alleged interest is eyebrow-raising, nonetheless. After trading Jimmy Garoppolo to the San Francisco 49ers last year, the Patriots were left without a future replacement for Tom Brady. Brady, at 41, hasn't let up at all, but his days as a starter are undoubtedly numbered. With a deep quarterback class this year, some thought the Patriots might look for a backup to develop behind Brady over the next few years. The Patriots apparently considered the same. That the Patriots didn't get Mayfield only pushes that decision further back, meaning, eventually, they will pull the trigger on a future quarterback.